Day thirty-seven was a travel day. Not much happens when you are behind the wheel all day. It is a two day trip from Dallas to Las Vegas. I spent a lot of time listening to my Spanish tapes. I am still having a hard time learning the language. I can read lips pretty good and, here in Texas, it is easy to understand what angry truck drivers are saying to me. I had to pass through Oklahoma. At a gas stop I tried my, “Do they play football in this state routine” on a young guy.” He was not as sharp as those bib overall-guys in Texas and answered politely, “We sure do mister and we’re pretty good at it.” I didn’t tell him about Michigan football. When I got out of my car I had apparently dropped something. The young man picked it up and returned it to me. It was an ice scrapper. I remembered that Jackie Hart had given it to me. It was a great gift for traveling through the south this year. Tom, her husband, gave me a pair of those cheap plastic gloves they used to issue to Firefighters in Detroit. You DFD guys remember, they were the ones that melted on your hands. It reminded me of the madness of appointing unqualified people to important positions, like purchasing for emergency services. It was a hallmark of the Coleman Young administration. The results of his mayor-ship are a poor excuse for a city occupying a beautiful piece of real estate. The city is still waiting for a mayor with vision and foresight. Let’s hope Dave Bing is that man. I rolled into Amarillo Texas about 6pm. I got a room and asked where I could get a cold beer. 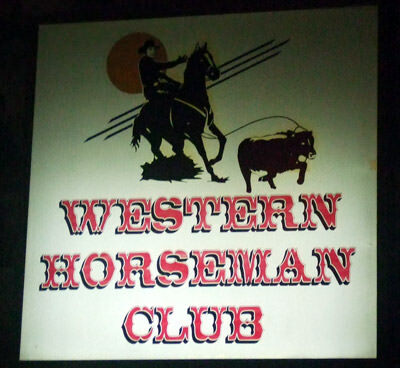 Just down the street from the Days Inn was the Western Horseman Club. When I walked in the juke box was playing a Conway Twitty song. The place had a real old west atmosphere about it. I talked to Dana the barmaid. She said Wednesday was a very slow day. No Karaoke, no dancing, not even any pool league action. She said the cowboys come to town on the weekend and the place really rocks and rolls. I asked her why the door was taped up. She said the cowboys keep crashing into it when they have a fight. Dana said, “It was broken, last week, when a couple of drunken cow hands rode into the bar to dance with their horses. It sounded like a fun place. When I head for home I will stop here on the weekend. I left Dana a nice tip and carefully opened the door to leave; I didn’t want to bump into any dancing horses.